They've taught toddlers to navigate tricycles and teenagers how to drive a car all in the same afternoon, planned baby showers for an eagerly-anticipated grandchild while decorating a nursery of their own and simultaneously juggled preschool and college event schedules. The life of an empty nester turned new parent is chaotic, complicated, and an absolute joy, adoptive families report. Married 21 years, with two teenage birth children, Howard and Kim were not welcoming the empty nest lifestyle their friends were enthusiastically embracing. "We enjoyed time with one another, but we felt pulled in a different direction, to something more," Kim recalled. "The thought of adoption came to us individually but basically at the same time." Jill's experience was similar. She and her husband, Rick, had two grown daughters and two teenaged boys by birth when the Missouri couple started imagining their impending child-free household. "We didn't really like the idea much," she said. "My heart ached to bring another child into the family. I could imagine the sound of little pajama-clad feet running across the floor. I wanted to set another plate at the dinner table. I had the perfect spot for a high chair. I was ready, and Rick soon admitted that he was ready too." "I think at first our teen children, Forrest and Toni, thought we had lost our minds," Kim recalled. "But as they saw adoption was a reality in our hearts, they completely accepted our decision and supported us through the paperwork and wait for a child." Jill's children had mixed reactions. "Our youngest son, Adam, had wanted a little brother or sister for a very long time, so he was thrilled. Our eldest daughter, Michelle, was 22 at the time and had been in the Air Force for about a year. She seemed genuinely excited and happy for us. Ricky, 19, accepted the idea, but said that it was going to be embarrassing to have parents our age with a new baby in the family." "Our 21-year-old daughter was unexpectedly upset by our decision," Jill continued. "Kristi seemed most upset that her old bedroom would become a nursery. We reassured her that we were going to keep a twin bed in that room for her in case she needed to come home again, and that we'd always find room for her 'stuff,' but we also told her that we never planned to keep her old bedroom as a 'shrine' forever. I could laugh about it, but she saw no humor at that time!" Fortunately, these misgivings were short-lived. "By the time that Ashlie came home, Kristi was ready to be a big sister again and was head-over-heels crazy for her baby sister!" Jill recalled. Both families, who have each adopted three daughters through Dillon International's China program, met with some puzzled reactions from friends and extended family members when they first announced their decisions to adopt. "We knew our older extended family members secretly thought we had lost our minds," Kim recalled. "Their feelings became more apparent as they asked questions about our decision. We knew they were waiting for us or the adoption process to fail. Once Halli was home, they fell in love, and they seemed to accept our decision" she added. "We have dealt with the same attitudes with each adoption. They love our girls, but they just never really understood our desire to adopt." Jill's family also dealt with concerns from their parents, adding that education helped. "I steered my mother to a Yahoo group for grandparents of children from China. That group was a wonderful place for my mom to work through her worries without vocalizing each one to me! As they read success stories of other grandparents, my parents became very excited about their grandchild who would be coming home." Before their first adoption was completed, both families knew they would likely adopt again. "As we waited for Ashlie, we started thinking about her growing up as an only child, and the only Asian child in our entire extended family," Jill said. "Rick and I decided that if all went well with our first adoption, we would likely adopt again. We intended for Allie to be our last child, but one day as I watched Ashlie and Allie playing together, I truly 'saw' three little dark-haired girls playing together. I knew that God was showing me that He had an even bigger plan. We soon started paperwork for Annie's adoption!" "Our hearts wanted to adopt a second child, but we didn't actively tell anyone of our plans until we started the paperwork process to bring Natalie home," Kim remembered. "Before we arrived home with Natalie, Howard and I both knew we would like to adopt another child. We entered our third adoption process with a strong sense of determination that carried us through a four-year wait." Kim's family did worry about their two oldest children's reactions as they planned subsequent adoptions. "One of my largest concerns has been whether my older children would resent the funds we spent to bring the girls home," Kim explained. "Most of Forrest and Toni's friends have parents with 'empty nests' who are able to help them financially as they begin their adult lives. Forrest and Toni have known that every 'extra' dollar we get goes into the adoption fund. 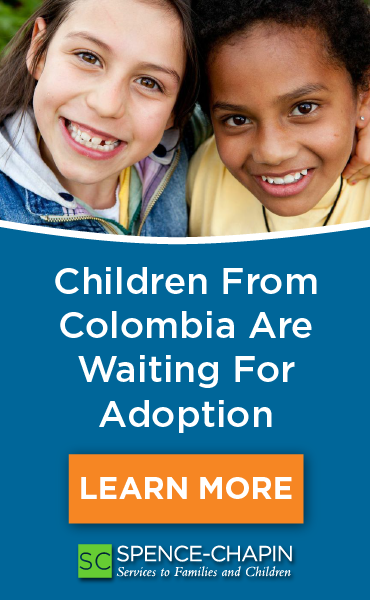 Anyone familiar with international adoption realizes that this could easily amount to over $75,000 dollars for our combined adoptions. An older biological child could see those numbers and wonder why Mom and Dad didn't find a way to help 'me' rather than bringing another child home. Our older children have never seen this as a 'why me' situation. When I open a conversation about this subject, both tell me they wouldn't change a thing, and I realize they mean that from the depth of their souls"
After overcoming initial hurdles, blending a family of birth and adopted children has been a delight, Jill said. "Raising two sets of kiddos is a blessing to us all," she explained. "It's a blessing to our youngest children who receive the love and devotion of older siblings. Our older kids are blessed by the love and adoration of their little sisters. It's a blessing to us as parents because we experience the joy of parenting all over again with a new appreciation of just how special all our children are." "Our successful adoption experience has been possible because our oldest children are willing to unequivocally accept our three newest family members as their siblings," Kim said. "They see the girls as their younger sisters, not their adopted sisters. They have made the effort to be close to the girls, and their efforts have paid off. They have developed a relationship that will ensure the girls have the support of a loving family even when Howard and I are no longer around. What a priceless gift! In the eyes of my children, we are just a family. They don't see the differences that others around us see." About the Author: Susan Serrano is director of media relations for Dillon International.